Stamp duty is a tax that is levied on documents. Historically, this included the majority of legal documents such as cheques, receipts, military commissions, marriage licences and land transactions. A physical stamp (a revenue stamp) had to be attached to or impressed upon the document to denote that stamp duty had been paid before the document was legally effective. More modern versions of the tax no longer require an actual stamp. The duty is thought to have originated in Venice in 1604, being introduced (or re-invented) in Spain in the 1610s, the Netherlands in the 1620s, France in 1651, Denmark in 1657, Prussia in 1682 and England in 1694. A Stamp Duty revenue stamp of Tasmania from 1892. The Australian Federal Government does not levy stamp duty. However, stamp duties are levied by the Australian states on various instruments (written documents) and transactions. Stamp duty laws can differ significantly between all 8 jurisdictions. The rates of stamp duty also differ between the jurisdictions (typically up to 5.5%) as do the nature of instruments and transactions subject to duty. Some jurisdictions no longer require a physical document to attract what is now often referred to as "transaction duty". Major forms of duty include transfer duty on the sale of land (both freehold and leasehold), buildings, fixtures, plant and equipment, intangible business assets (such as goodwill and intellectual property) debts and other types of dutiable property. Another key type of duty is Landholder duty, which is imposed on the acquisition of shares in a company or units in a trust that holds land above a certain value threshold. A temporary stamp duty was introduced in 1657 to finance the war with Sweden. It was made permanent in 1660 and remains on the statute book although it has been substantially altered. Most stamp duties were abolished from 1 January 2000 and the present act only provides for stamp duties on insurance policies. Stamp duties on land registration were renamed and transferred to a separate statute but remain essentially the same, i.e. 0.6% on deeds and 1.5% loans secured against real estate. Stamp duty is approached by the European Commission regarding raising of capital (capital duty). Council Directive 69/335/EEC of 17 July 1969 concerning indirect taxes on the raising of capital stated that transactions subject to capital duty shall only be taxable in the Member State in whose territory the effective centre of management of a capital company is situated at the time when such transactions take place. When the effective centre of management of a capital company is situated in a third country and its registered office is situated in a Member State, transactions subject to capital duty shall be taxable in the Member State where the registered office is situated. When the registered office and the effective centre of management of a capital company are situated in a third country, the supplying of fixed or working capital to a branch situated in a Member State may be taxed in the Member State in whose territory the branch is situated. Indirect taxes are also entirely prohibited on the issue of certain securities and debentures. One example is shares of companies which are either incorporated in Hong Kong or listed on the Hong Kong Stock Exchange. Other than the said shares, HK Stock is defined as shares and marketable securities, units in unit trusts, and rights to subscribe for or to be allotted stock. Stamp duty on a conveyance on sale of land is charged at progressive rates ranging from 1.5% to 8.5% of the amount of consideration. The maximum rate of 8.5% applies where the consideration exceeds HK$21,739,130. The Special Stamp Duty was enacted by the Legislative Council on 29 June 2011 and would take effect from 20 November 2010. An enhanced rate of the Special Stamp Duty and the Buyer's Stamp Duty was enacted by the Legislative Council on 27 February 2014 but would take effect retrospectively from 27 October 2012. The government regularly updates its Stamp Duty laws and in addition to the above, several other amendments have now been published which are also aimed at cooling the property market. Third party calculators make it easier to understand the complex set of rules, making it easier to under the latest cost of buying or selling. In the Republic of Ireland stamp duties are levied on various items including (but not limited to) credit cards, debit cards, ATM cards, cheques, property transfers, and certain court documents. Stamp duty was formerly a graduated progressive tax with more expensive the house bought the greater the stamp duty rate. The top rate slowly increased from 0.5% in 1882 to 3% in 1947, 5% in 1973, 6% in 1975, reaching its peak at 9% in 1997. The budget of 2008 inaugurated a series of rate reductions. After 2011 the stamp duty tax is set at 1% for residential properties up to €1 million and 2% on the remaining amount. Non-residential real property, building, insurance policies, the intangible business property goodwill are taxed at 2%. A lease for property of any type is taxed according to the lease duration, 1% of the average annual rent, or the market rate whichever is greater, if 35 years or less, 6% up to 100 years, and 12% for a lease of more than 100 years duration. Counterparts (duplicate copies) of documents are taxed the lesser of €12.50 or the duty on the original document. The value of property for stamp duty excludes VAT. Gifts are taxed at market value. Several exemptions including those for gifts between close relatives and first time home buyers expired in 2010. The transfer of stocks and marketable securities is taxed at 1% if over €1,000 or if a gift. Stock warrants in bearer form are taxed at 3% of the value of the shares, and the issue of (new) bearer warrants was prohibited effective 1 June 2015. From 1998, stamp duty in Singapore only applies to documents relating to immovable property, stocks and shares. Purchases of Singapore property or shares traded on the Singapore Exchange, are subject to stamp duty. The Inland Revenue Authority of Singapore (IRAS) mandates stamp duty payment within 14 days from signing of the document if done in Singapore and 30 days if the document is signed overseas. Failure in payment within the fixed time entails heavy penalty. Oo Applicable rates and more information can be obtained from Inland Revenue Authority of Singapore. 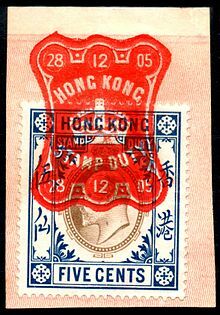 Legislation covering Singapore Stamp Duties are found in the Stamp Duties Act. Swedish law applies a stamp duty on property deeds, at 1.5% of the purchase value. In addition, a stamp duty of 2.0% is levied on new mortgage securities ("pantbrev") for properties. The "Stamp Duty Paid" mark that appeared on British cheques from 1956 to 1971. There is now no duty on British cheques. "Stamp Duty Reserve Tax" (SDRT) was introduced on agreements to transfer certain shares and other securities in 1986, albeit with a relief for intermediaries such as market makers and large banks that are members of a qualifying exchange. "Stamp Duty Land Tax" (SDLT), a new transfer tax derived from stamp duty, was introduced for land and property transactions from 1 December 2003. SDLT is not a stamp duty, but a form of self-assessed transfer tax charged on "land transactions". On 24 March 2010, Chancellor Alistair Darling introduced two significant changes to UK Stamp Duty Land Tax. For first-time buyers purchasing a property under £250,000, Stamp Duty Land Tax was abolished for the next two years. This measure was offset by a rise from 4% to 5% in Stamp Duty Land Tax on residential properties costing more than £1 million. Further reforms were announced in December 2014, so that rates are now paid only on the part of the property price within each tax band. In the 2015 Autumn Statement the Chancellor announced that buyers of second homes (whether Buy to let or holiday homes) would pay an additional 3% with effect from April 2016. Stamp Duty Land Tax only applies throughout England and Northern Ireland. In Scotland, SDLT was replaced by Land and Buildings Transaction Tax on April 1st 2015. In Wales, Land Transaction Tax was introduced in May 2018. Although the federal government formerly imposed various documentary stamp taxes on deeds, notes, insurance premiums and other transactional documents, in modern times such taxes are only imposed by states. Typically when real estate is transferred or sold, a real estate transfer tax will be collected at the time of registration of the deed in the public records. In addition, many states impose a tax on mortgages or other instruments securing loans against real property. This tax, known variously as a mortgage tax, intangibles tax, or documentary stamp tax, is also usually collected at the time of registration of the mortgage or deed of trust with the recording authority. Indian laws require stamp duty payments on limited category of transaction documents. Broadly, documents affecting rights and title to property require stamp duty to be paid. Central government requires stamp duty to be paid on a few classes of transaction documents, primarily focussed on securities, under the Indian Stamp Act, 1899. It is the state government under various state laws that charge stamp duty on many transactions. For example, Maharashtra state's stamp duty law is governed by The Maharashtra Stamp Act, 1958 (Bombay Act LX of 1958 ). The rates and documents for which stamp duty is required varies across different states in India. ^ "Hong Kong e-Legislation". www.elegislation.gov.hk. ^ "Former Rates of Stamp Duty". Irish Tax and Customs. Retrieved 22 January 2016. ^ "Property other than stocks and marketable securities and policies of (life and non-life) insurance". Irish Tax and Customs. Retrieved 22 January 2016. ^ "Exemptions and Reliefs from the charge to Stamp Duty". Irish Tax and Customs. ^ "Shares, Stocks and Marketable Securities". Irish Tax and Customs. Retrieved 23 January 2016. ^ "Stamp duty payment duration and related penalty in case of failure". 3ecpa_Singapore. Retrieved 27 February 2015. ^ "HMRC Stamp Taxes Manual" (PDF). p. 8,11. ^ Jones, Rupert (24 March 2010). "Budget 2010: stamp duty boost for first-time buyers". The Guardian. Retrieved 25 August 2011. ^ "Stamp Duty Land Tax". ^ "Insurance stamp tax". The Independent. 14 December 1914. Retrieved 24 July 2012. ^ "The Indian Stamp Act, 1899". Indiacode.nic.in. Retrieved 14 April 2019. Wikimedia Commons has media related to Stamp duty. This page was last edited on 17 April 2019, at 22:11 (UTC).